CAMP HILL, Pa. — Reflecting Rite Aid Corp.’s expanded organization and breadth of health care services, Ken Martindale has been promoted to a new position, chief executive officer of Rite Aid Stores. At the time of the promotion he was president and chief operating officer. He retains the role of president and continues to report to chairman and CEO John Standley. Martindale’s promotion was one of a number of significant executive changes that have been implemented since Rite Aid completed its acquisition of Envision Pharmaceutical Services (EnvisionRx), a pharmacy benefits management firm, in June. Since he joined Rite Aid Martindale has played a key role in the drug chain’s turnaround, and Standley acknowledged his contribution. The EnvisionRx acquisition represents a huge strategic step forward for Rite Aid. “The combination of EnvisionRx’s broad suite of PBM and pharmacy-related businesses with Rite Aid’s retail platform will provide our customers and patients with an integrated offering across retail, specialty and mail-order channels,” Standley noted at the time of the deal. Martindale joined Rite Aid from Pathmark Stores Inc., where he last served as co-president and chief merchandising and marketing officer. He initially took on the role of senior executive vice president of merchandising, marketing and logistics at Rite Aid and was elevated to senior executive vice president and chief operating officer in 2010. He moved up to president and COO in June 2013. His expanding scope of responsibilities has included leadership of the major initiatives that have fueled Rite Aid’s recovery and given the nation’s third-largest drug chain a viable platform for growth as well as strategic points of differentiation from the competition. Perhaps the most critical of these has been the development of the wellness store format, which has now been implemented in more than 1,700 of the chain’s nearly 4,600 locations. Plans for the current 2016 fiscal year call for a total of 400 wellness+ remodels. 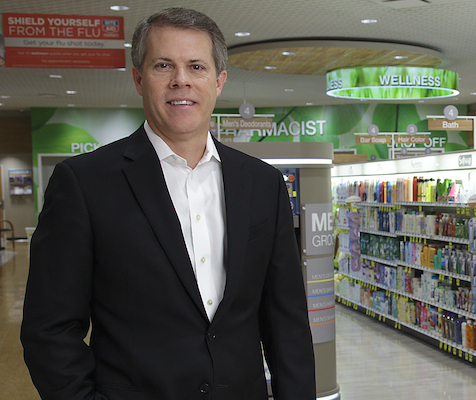 Martindale told analysts in April that the wellness stores continue to outperform the rest of the chain both at the front end, with higher front-end same-store sales, and at the pharmacy, where they generate higher script counts. During the company’s first quarter conference call in June, Martindale elaborated on the revamped stores’ features. “These stores include enhanced design, innovative merchandising concepts, expanded wellness product and service offerings, and a higher level of service through our more than 2,000 wellness ambassadors,” he said. Another major initiative has been Rite Aid’s wellness+ loyalty program, which has been highly successful and received a major enhancement in May when Rite Aid partnered with Plenti, the first coalition loyalty program in the United States. Other companies that are part of the coalition include AT&T, Macy’s Inc., ExxonMobil, Nationwide Insurance and Hulu. Through wellness+ with Plenti, Rite Aid’s wellness+ members can earn, in addition to the benefits they receive through wellness+, Plenti points that can be used at Rite Aid locations or at certain other Plenti partners. The chain has also deployed its Rite Aid RediClinics in three markets: Philadelphia; Baltimore-Washington, D.C.; and, most recently, Seattle. The company plans to open 50 clinics during the course of the fiscal year, which will bring its total to more than 100. In another strong bid to offer differentiated services, Rite Aid last month partnered with HealthSpot to launch HealthSpot telehealth stations in 25 Ohio Rite Aid locations. Each 40-square-foot station enables customers to engage with a variety of recognized health care providers in privacy by using teleconferencing technology and interactive medical devices. A trained attendant can provide assistance to patients as needed.